In 1836 an elephant drowned off the coast of New Brunswick. Poet Richard Outram explores the significance of this bizarre occurrence in his brilliant new volume of poetry, Mogul Recollected. These witty and profound poems recreate the dismal conditions of Mogul’s existence before he plunged to his death during a ship fire. Some are told from the point of view of Mogul himself, others from the perspective of ruthless trainers and circus owners. Recasting the tragedy as an inversion of the Noah’s Ark story, Outram delineates with startling clarity man’s betrayal of beast. quintessence, numberless as thou seest. No. It is closed, clothed in darkness for all time. calm in the loomed elephant rage to be. Wherein it mirrored the creature sun. quenched forever at last in Penobscot Bay. and did, real tears from his small eye. In common with man, not without cause. He drowned in salt water. in the myriad present: which is immortal. what he became: his one death. This is the final poem in Richard Outram’s 1993 book, Mogul Recollected. Taken on its own, it cannot convey the cumulative power of the collection, which concerns a true event, the 1836 sinking of a ship in Penobscot Bay. The Royal Tar was transporting a circus when, during a storm, the mishandled boiler caught fire. Terrified by the waves, but also the flames, Mogul the elephant refused to jump into the ocean. instead he placed his forelegs on the deck railing, which then collapsed under his weight causing him to plunge onto a full life raft. All, including the elephant, drowned. The poems look at the tragedy, which would otherwise be lost to history, from every possible angle, and here, in the final poem, the reader, already forced to contemplate not only the significance of death by fire and water of a fellow creature, but also its terrible treatment in life, now must look Mogul directly in the eye and ask the age-old question: why must we suffer? The question is, of course, as unanswerable as the darkness of the death we are ‘‘beholden’’ to is inevitable. (Death and the ability to suffer are two more things we have in common with elephants beyond the ability to cry.) Yet Mogul’s brave eye, ‘‘the still centre,’’ ever sought out the light, which in turn ever diminished as he moved from freedom to captivity, until it was just the ‘‘rebounding blaze’’ from the burning ship reflected in the water bucket of slavery. Still he saw it, ‘‘eternal’’ light. he saw with that light-seeking eye, instead of through it. In none of the four or five times that I’ve read Mogul Recollected, have i been able to get through it without sobbing for an elephant who perished more than a century and a half ago. The poems are a call to compassion, which literally means ‘‘to suffer together.’’ We suffer with the animals (though somewhat less so than they, I would venture), yet it is they who teach us how we might finally reach immortality. With their particular wisdom -- instinct, intuition, creature insight -- they perceive ‘‘life in the myriad present,’’ which goes on and on, recorded or not. 1. There are two epigraphs to the collection: one, an extract from The Circus Ship Fire, and one from Kierkgaard’s Stages on Life’s Way -- what do these two epigraphs suggest about history and memory? How do these concepts intersect or diverge throughout Mogul Recollected? 2. In The Circus Ship Fire, the writer says Mogul ‘‘had refused to jump into the ocean’’, presuming (or projecting) Mogul’s intentions. Many of Outram’s poems place Mogul as speaker -- how do these poems ‘‘rebut’’ history as presented in The Circus Ship Fire? 3. Religious imagery pervades Mogul Recollected -- what is presented as sacred? How does Outram place the profane? 4. Examine Outram’s use of Mogul as an animal narrator -- how are other animals presented? How are humans presented? 5. What is Outram suggesting about life more generally through the narrative of Mogul and theRoyal Tar? 6. In ‘‘Record’’, Outram writes ‘‘Mogul’s death is a black-and-white./ Fixed letters on a page’’ -- what does Outram present as ‘‘grey areas’’ in the text? How can something be both ‘‘black-and-white’’ at the same time? Outram was born in Canada in 1930. He was a graduate of the University of Toronto (English and Philosophy), and worked for many years at the Canadian Broadcasting Corporation as a stagehand crew leader. He wrote more than twenty books, four of these published by the Porcupine’s Quill (Man in Love , Hiram and Jenny , Mogul Recollected , and Dove Legend ). He won the City of Toronto Book Award in 1999 for his collectionBenedict Abroad (St Thomas Poetry Series). His poetry is the subject of a significant work of literary criticism, Through Darkling Air: The Poetry of Richard Outram, by Peter Sanger (Gaspereau Press, 2010). 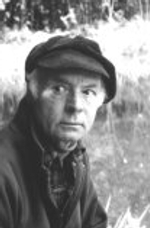 Richard Outram died in 2005.